The autopsies of Lizzie Borden’s father and stepmother were conducted one week after the murders – August 11, 1892, in the “ladies waiting room” at Oak Grove Cemetery. It is the structure to the left in this picture postcard below. Here is a more contemporary view: The little building is now used to house gardening tools and supplies and also serves as a break room for the grounds-keepers. 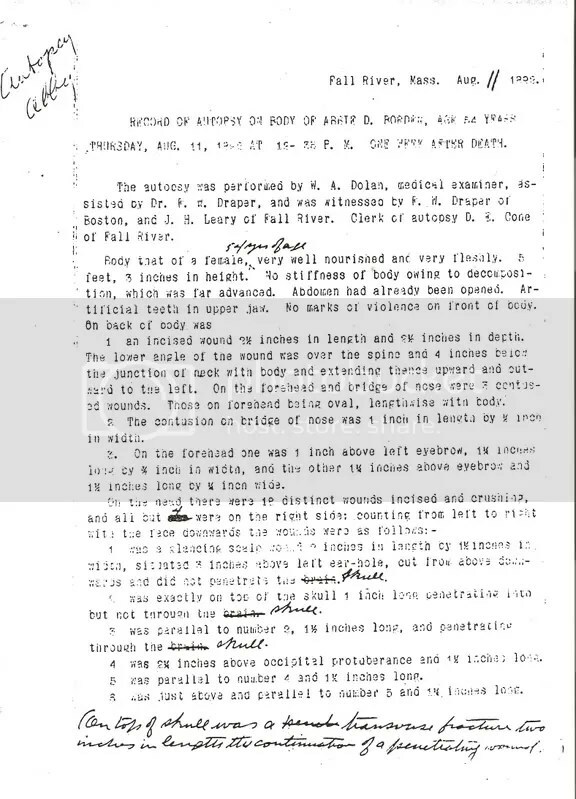 Upon the instruction of District Attorney Hosea Knowlton, the heads of Andrew and Abby were severed and taken home by Dr. Dolan. They were unceremoniously boiled of their flesh on his kitchen stove (much to the fright of his two young sons), and maintained in his home until presented in court at the Preliminary Hearing. The sisters were not informed, nor the media – one of the better kept secrets of the prosecution’s case. Below is the link to the letter from Dr. Dolan’s grandson, Donald Dolan, to Robert Flynn dated March 6, 1992. (Don Dolan was a teacher, and a Presenter at the 1992 Lizzie Borden Centennial. He passed away May 15, 2002 and is buried at Rutland Town Cemetery in Mass. His widow, Joyce, still resides in the same home they shared for 50 years). 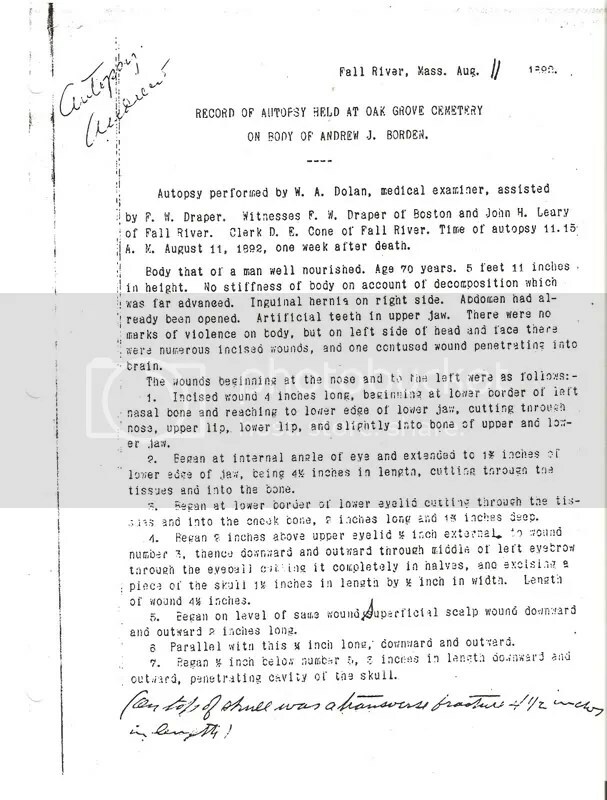 A thorough reading of the actual typed autopsy reports, including hand written notes, is available from the images below. (Right click on the text below for larger view). 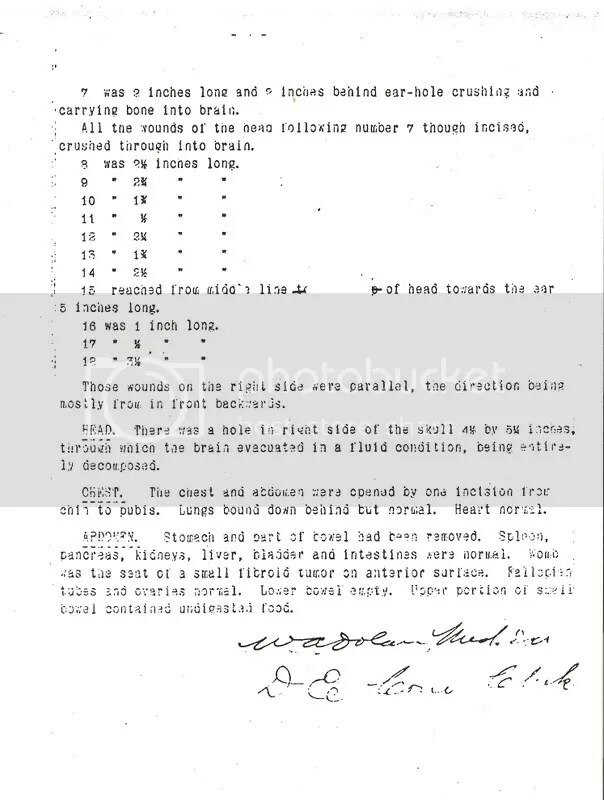 It wasn’t until after the Trial in July of 1893, when Hosea Knowlton wrote to Dr. Dolan stating that Lizzie and Emma’s legal counsel, Andrew Jennings, wanted the skulls returned. Click to see returnskulls. The skulls were subsequently buried in boxes about 3 feet below ground. Placement was a “guestimate”. Note1: Robert Flynn is a publisher, author and former bookseller. Note 2: Joyce Dolan told me Don Dolan remembered his father (Dr. Dolan’s son) telling him of seeing Abby’s hair switch in the attic of their home where other “evidence” was kept. 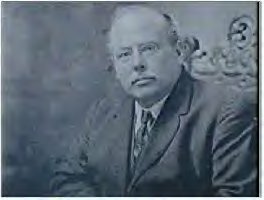 Note 3: Dr. William A. Dolan had 4 children; 2 sons (Tom and William A. Dolan, Jr. – Don’s father) and 2 daughters (Ellen, called “Nellie” and Mary – both were spinster school teachers in Fall River). 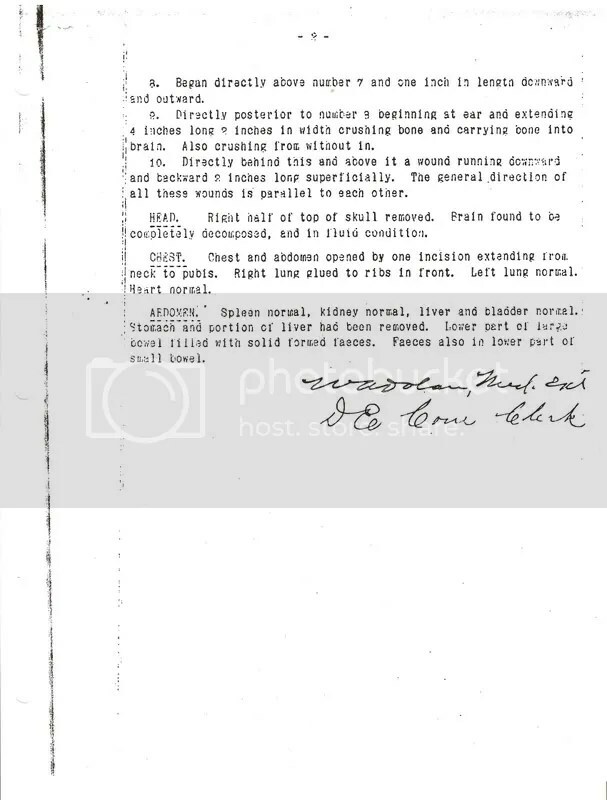 I have seen the autopsy reports typed up in a WORD format but never the copy of Dr. Dolan with his notes. This was great! Thanks faye so much for your terrific blog and all the information you put here for us Lizzie case nuts. I learn a lot from you. So please keep it up! Here’s where I should have posted my comment about the “brutal” letter written by John Gray to Dr. Dolan. I propose that the missing word in the last sentence might be “mis-honed razor” without the dash.